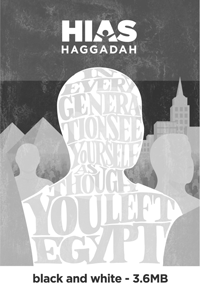 The new HIAS Haggadah offers a deeper exploration of the global refugee crisis. It can be used as a whole or each part can be used as a stand-alone addition to a family or communal Seder. The Haggadah contains material written between 2016 and 2018, as well as new material and illustrations for Passover 2019. Before your Seder, spend some time reading through the entire document to familiarize yourself with which piece(s) might resonate most with your guests. Consider balancing discussion, readings, and ritual. 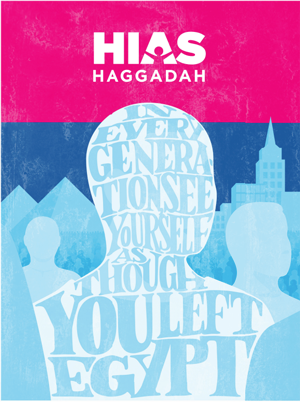 Print at home: The free downloadable HIAS Haggadah files here are formatted to be printed on most home or office printers. Click the color or black and white image to begin PDF download. We recommend two-sided printing to save paper, then just staple in the top left corner! 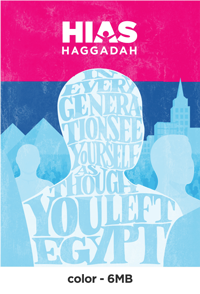 Buy the Paperback on Amazon: If you want a high-quality paperback version, you can order the HIAS Haggadah on Amazon! Bulk Press-Quality Printing: We have also formatted a press-ready version [download] intended for professional print shops or online printing if you wish to produce a large number of copies. This 300dpi file includes bleed for a final folded size of 8.5" x 11". We recommend 60 or 80 lb paper, glossy if you like, “saddle stitched” (stapled) along the fold. Should cost $3-5 each, depending on quantity. MagCloud: the printed, stapled booklet can also be ordered from MagCloud (volume pricing available). Synagogues or groups holding community Seders interested in printing more than 50 copies, please get in touch with us at info@HIAS.org. Yes, please let me know when the HIAS Haggadah is available.